That’s right, our second son arrived 12 weeks ago, just over 38 weeks into my pregnancy. Little J is small – he was just over 6 pounds three weeks after birth and is still not on the growth chart – but he’s doing well. He’s cooing and smiling and doing all the things little nuggets his age tend to do. And so, I have finally found the time to emerge from deep in the newborn forest to share my experience of his birth. Some of you will remember that my husband and I were debating whether or not to try for a vaginal birth after having our first son via c-section (known as a VBAC). In the end, after much consultation with our midwives and an OB-GYN, we decided to give my body until the due date to go into labour on its own, without any medical induction, and to book a repeat c-section if that didn’t happen. I will confess that while on one hand I was pretty sure that the baby wasn’t going to wait until the due date, I simultaneously thought there was a solid chance that my body would not cooperate by going into labour. My own medical history, my experience at the end of my last pregnancy and struggle with breastfeeding the first time around had led me to believe that my body was a bit of a dud. Turns out, I needn’t have worried. My water broke mid-morning, but contractions didn’t start right away. When they did, they were mild and sporadic, coming every 20 minutes or so. My midwives told me to expect a long wait, and that the baby probably wouldn’t arrive until the next day. Just go about your day, they said. Try to eat well and get some rest. For extra security, we had my in-laws pick up our 2.5 year old just before noon. I cried when he left, knowing that things would always be just a little different moving forward. We watched an episode of John Oliver and then my husband, who had taken a sick day from work before we knew things were starting (sorry, love! ), went to take a nap. I turned on a movie, thinking I had a whole day of gradually-progressing labour ahead of me. The mild contractions continued, still 15-20 minutes apart. Then it was like someone hit a switch. I hadn’t gotten half-way through the movie before my every-20-minutes, mild contractions suddenly became strong contractions that seemed to come on top of each other, about 2 minutes apart. My poor husband was jolted awake by my yelling to him from the bathroom. We called the midwife, who stayed on speaker phone through a few contractions before telling us to head to the hospital. I wasn’t having it. I did not want to get in the car. This was my first labour, and things had come on so quickly. I was convinced that baby was going to be born right there in the bathroom. Fortunately, my midwife was able to convince me that I definitely wouldn’t want to get in the car later on, and so my husband ran frantically around the house, grabbing the various bags I had prepped, with me barking random orders: “Here’s my hairbrush”, “Make sure the cats are inside”. The poor guy was so flustered that the TV was still on when he got home the next day (sorry again, love). The ride to the hospital is a blur. I discovered that having the car seat against my back provided significant comfort and I focused my mind on breathing through each contraction. The midwives met us at the hospital just before 5pm and found that I was already 6cm dilated. In all, I had about 4 hours of active labour and 16 minutes of pushing before little J emerged, one hand up near his face, fist-pumping his way into the world. My husband described them as four of the longest hours of his life, but for me the time sped by. To be honest, I had no concept of time. I found comfort in holding my husband’s hand throughout, but otherwise I turned deeply inward. My whole world became entirely about just getting through. I had expected the pain, but the intense pressure of the baby moving downwards took me by surprise. Like so much about parenting, my expectations of labour didn’t sync with my reality. I had always thought that I would be a person who would embrace pain medication, and I tried taking the edge off with nitrous oxide. But I didn’t like the light-headed feeling it gave me, preferring instead to keep my mind focused. I had anticipated that I would want to move around a lot during labour, and had pictured myself giving birth in a position that would use gravity to my best advantage – standing or squatting or resting on all fours. Instead, all I wanted was to lie on the bed, with the pillows and mattress providing soothing counter pressure against my back. My body was so eager to bring J into the world that it started to push even before I was fully dilated. My midwives helped J arrive safely just before 8pm, all 5 pounds and 14 oz of him. And suddenly, there he was: a tiny body snuggled onto my chest, just as I had wished for so many times since my c-section. It was the greatest relief and my world was just the three of us, cozy, safe and happy. There was a knot in J’s umbilical cord, created by his pre-natal gymnastics, which fortunately hadn’t completely tightened. If it had, he probably would have died due to his oxygen being cut off. His small size and quick delivery had saved him. This was the first scary surprise of the night. J’s birthday fist-pump and his quick arrival meant that I had what the nurse later called an “impressive” tear. My midwives brought in an obstetrician to do the repair. To help keep me comfortable and calm during the hour-long process, I was taken into the operating room and given a spinal anesthetic. I chatted away to one of my midwives to keep my mind off the work being done to repair my body. I got back to the recovery room and suddenly felt like I was fading. The combination of blood loss and fluids given to off-set the spinal meds dropped my blood pressure to 40/20. At the time, I didn’t know how serious this was. I just saw everyone around me jump into action. I was given two pints of blood and recovered quickly. I saw the colour return to my husband’s worried face as it returned to mine. We both finally got to eat and rest, and our cozy world was back to the way it had been immediately following the birth. 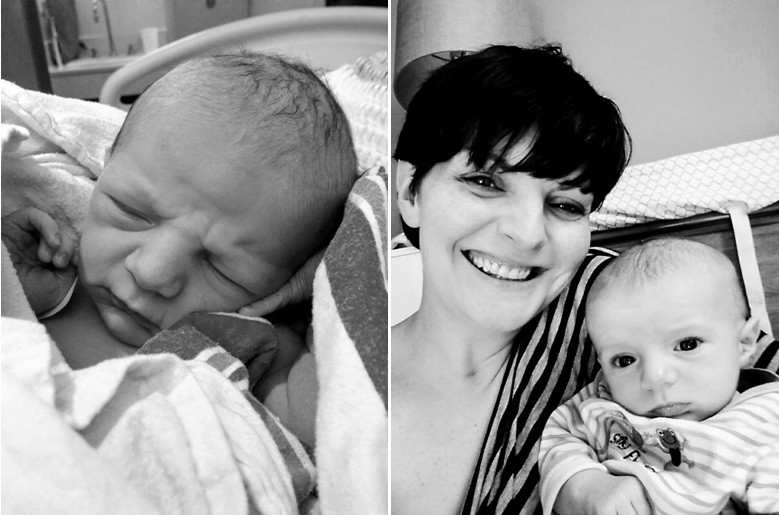 It took me a few weeks to process my experience of J’s birth – the trauma and the joy. It’s amazing how quickly the details fade, a by-product of sleep deprivation, no doubt. Now we have officially made it through the fourth trimester and all the intense-newborn-focus that that entails. My body has healed, though I’m still doing a bit of physiotherapy to ensure that healing process goes as well as it can. L has accepted that the baby isn’t going anywhere. While he has yet to agree to hold him, he likes when his little brother smiles at him. Our new normal is starting to feel a little less new. Our adventure as a family of four is well on its way and I’m looking forward to sharing it with all of you. Our little bean, on his birthday and at 11 weeks old.